The PROLITE-60 is the result of intense research work associated with the development of the latest optical communication systems. A priority for telecommunication operators all over the world is to make their already existing optical networks more efficient. The first step is to increase their capacity. This can be achieved by simultaneously using more wavelengths to transport the information. are not wavelength selective. An optical spectrum analyser is required to check the output of a fibre when, for example, eight laser sources are used. 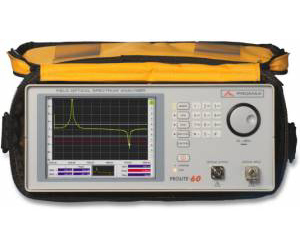 The PROLITE-60 is the first optical spectrum analyzer that is truly portable, rugged, and battery-operated at a really attractive price. The PROLITE-60 is also suitable for many other applications. Using the various available options, it is suitable for reflectometry, analysis of materials, analysis of fibre sensors, and testing of photonic devices such as filters, attenuators, couplers, isolators, and other optical components.